Okay follow this. 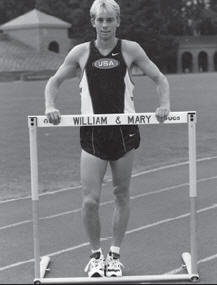 Andy Gerard was W&M's distance coach before he moved to Palo Alto to be the head XC coach at Stanford where he was before he moved to George Mason. Two days ago he was promoted to become the first head of the combined programs. Yesterday Stanford announced that former W&M runner and current UVA coach, Jason Dunn (who was coached by Andy Gerard) has been selected as the new women's distance coach. Of course Stanford came to its recent prominence under Vin Lananna (now at Oregon) who ran for former W&M coach Roy Chernock back when they were at CW Post College. So it all connects back to W&M! Ed Moran ran 7:58 for 3000 meters well off the PR he set a few days ago. He still has two races left on his European trip. Coming off his 4th in the 10K at the Olympic Trials, Moran ran 3 seconds better than his best 3K last year to place 13th in 7:47.86. Next up is a 5K this Saturday in London. Christo Landry and Emily Anderson led a fleet of great performances this past year. But theirs and the other great accomplishments do not come cheap. Flying to the NCAA tune-up meet in the fall, the regional NCAA meet in the spring, not to mention traveling to the IC4A/ECAC meets costs a great deal of money. Several weeks ago you received a newsletter with a form and envelope to send back a contribution to the team. If you would like to help our growing team, there are a bunch of jobs listed in the newsletter. 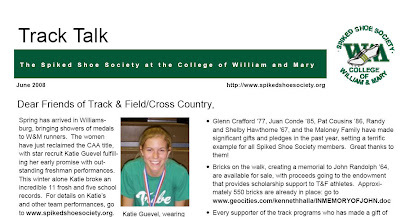 Remember how important track/xc was to you in college and please consider giving a contribution and/or your time. If you have questions, please feel free to e-mail me kenhalla@hotmail.com. If you did not get the newletter please click on the link or picture above to see it. Also Ed Moran is now in Sweden and will be running several races beginning this Wednesday which will be featured on this site. A year ago Graney '11 was a 5 flat miler. On Tuesday she will be competing in the first round of the World Junior Championships in the steeplechase (and finals on Thursday), an event she only started running this year. Furthermore she now holds the frosh record in the event and stands as number two on the W&M all time list. To hear how one does so much in a year, click here (minute to upload). As the trials wrap up, I thought it would be interesting to see all of the W&M runners who have made the trials. Unfortunately I don't know how far many of them made it, so if you know, please put a comment. Click here to see the names. 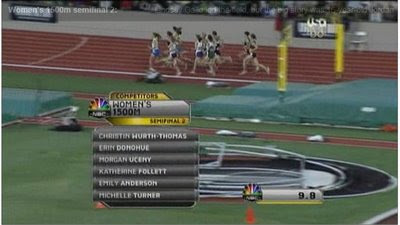 Running in the second semifinal, Anderson finished 10th in 4:20.85, which placed her 19th overall between the two heats. Her time placed her one spot ahead of Arkansas’ Dacia Barr, a nice turnabout from the NCAA Championships where Barr finished fourth, one spot ahead of Anderson. Anderson will take a well-deserved break after a cross country and track season that began almost 10 months ago. Over that time, she has racked up accolades, including CAA Track and Field Athlete of the Year, All-American, two ECAC Championships, and all-region honors in track; All-CAA, All-Southeast Region, and All-East honors in cross country; and four school records. Click here or on the picture above to see her entire race. W&M has had some people come very close to the Olympic team (Howell Michael in the 1500 in the 70's and Matt Lane who was 4th in the 5K in 2000 and 2004). Brian Hyde made the US team for the '95 World Championships in the 1500 by finishing 2nd at the national champs and then finished 5th at the '96 Olympic Trials, but still made the team by virtue of being the 3rd person who had the "A" standard. This week, Ed Moran will be shooting to our second Olympian. Hear Brian's interview where he talks about his experiences on both teams and why he thinks Moran will likely be our next Olympian (and see a newly added interview with him in the story below this one). Click here to hear the podcast (will take a minute to load).